I’m pretty excited, because this is my first time blogging for Nutblocker! I’ve always liked the content and design of the site, and am extremely excited to be creating some content and writing a couple of blogs per month. I struggled in the beginning thinking about what I could write about.. One thing I find fascinating about being a poker player is the perception of what the outside world thinks of what we do for a living. A common connotation that average people have of poker players is that their lives are composed almost entirely of bottle service and million dollar upswings. Of course we’re well aware this isn’t always the case.. I do believe that some players lead pretty atypical lives, and in 2013, I can certainly say that I’m one of those people! But more importantly, what I’ll do with this blog is provide into the everyday effort that goes into taking your game to the next level. 2013 has been the most profitable year for me to date, mostly because I was fortunate to run good / play good for a three-day during the summer and take down the 1500NL six-max at the WSOP. 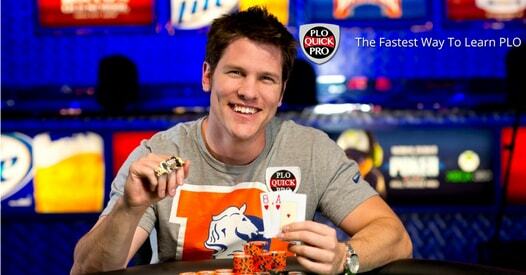 Sure, taking down the bracelet and winning a heap of money was a life-changing experience for me personally.. But since I’m writing this blog to share with you as much knowledge as possible, my goal is to reflect on my poker experiences and give you as much insight as I can in the hopes that what I’ve learned along the way can turn you into the player you want to be. 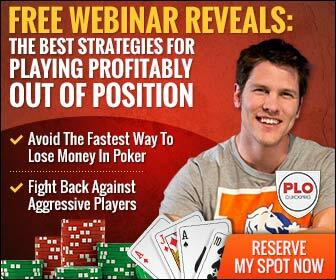 I’ll also provide you with insight into the daily grind of a PLO Pro, and give you as much advice as I can on how to learn the game from the ground up. It seems like only yesterday that I became obsessed with learning everything I could about the four-card game, and while I still have lots to learn, I do know that there are many people out there that want to become successful at this game more than anything… And since I was one of those people not long ago (and still strive to become the best player I can), I will do my best to make the path from where you are to where you want to be as short as possible! 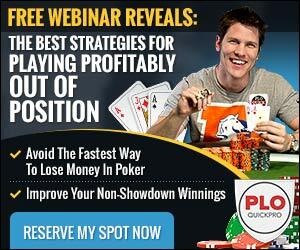 When I first started playing PLO, I had the idea that if I read every poker book.. If I dissected every poker hand on the forums.. 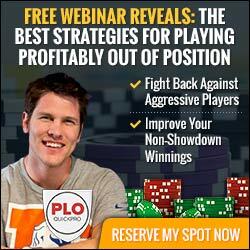 If I watched every video from every poker instructor, that I would know EVERYTHING there is to know about PLO, and as a result nobody could stop me from becoming a high stakes pro.. Because after all, information is power, and if I have all the information, then I’ll be able to read souls and own everyone else who doesn’t possess that same information. This is only partially true. While it’s impossible to dispute the importance of having a solid theoretical foundation, in my opinion there are several equally, or perhaps more important qualities to master that don’t involve range analysis or combinatorics calculations. Many of the best (and richest) players I’ve come to know personally have terrible flaws in their understanding and application of poker theory.. Likewise, I know many poker players with exceptional understanding of poker theory, but that struggle to even breakeven at 25PLO. One of these overlooked qualities is learning to trust your instincts and make decisions for yourself. With the abundance of poker training available nowadays, it’s easy to fall into the habit of copying an instructors style of play.. Right down to the bet sizing and game selection of your favorite pro. After all, the brain likes what is the same.. And if I just do what they do, then I’ll win as much as they do, right? This statement would potentially hold truth if poker were as basic as say.. An RPG video game, or a basic board game. But realistically, poker, and PLO in particular, is so complex and contains so much incomplete information that simply trying to copy a style without inserting any of your own logic or style will stunt your growth as a player and serve as a barrier to reaching your goals. In the old days, when I encountered a marginal spot in a cash game, or a big decision in a poker tournament, my first reaction was to think about what a successful friend of mine would do.. Or how a video instructor handled a similar spot in one of the recent videos I saw, and then base my decision on that. At either a conscious or subconscious level, I assume that part of my reasoning for this was so that I could “blame” a potentially negative outcome on the fact that I copied a line that I previously had seen work successfully.. Rather than having the confidence to assume full responsibility for making a competent decision on my own. And hey! I saw Phil Galfond do it in a video, so it can’t be bad, right?? As you know.. Shouldering responsibility for decisions is easier said than done.. And because we are constantly receiving positive/negative and win/lose feedback each hand, our natural behavior is to relieve some of the anxiety of taking a wrong turn by telling yourself that you did everything you could to make the situation right. But in the end, you need to find the path to what I call “falling in love with your game”. Once you get to the level where you can trust your reads.. Or more importantly, trust a read in the moment and then have the willingness to learn from your mistakes.. Then you will be far closer to the goal of thinking like a real pro. The key here is to objectively assess whether you took in the wrong information, or if you processed the information incorrectly. Sometimes, you can think that someone looks weak.. When in fact they’re strong. This is an example of interpreting information incorrectly. This is not a bad mistake! These are easy to learn from with some experience over time. The other side is not knowing an important skill, or what to do in a specific spot. These are commonly known as “leaks”. Maybe you have bad three-bet sizing. Maybe you don’t value bet thin-enough. These are easy to fix with a coach, or through forum interaction and video watching. Ultimately, the best players in the world don’t strive to think like anyone else. They develop their own style and opinions about how a hand should be played, and resolve to think like themselves. And in the end, one of the most beautiful aspects of poker is that not one set style works or wins over the long term. Constant adjustment and observation is necessary to succeed at any level, and if you’re a low stakes guy right now, you need to do whatever you can to get in the habit of trusting and believing in yourself starting NOW. Learn from others, but in the end, have the confidence to trust yourself and your abilities. After all, if you don’t believe in yourself, then why should anyone else believe in you? Please let me know what you want me to write about in the next blog, or if you have any other PLO related questions in the meantime. GL! View from my seat before we began HU play. I won all the chips!! Got a table right next to Calvin Harris booth at Hakkasan following the win. Thanks Ben and Chance!